The arrival of Our Kind of Traitor so soon after the TV miniseries The Night Manager only magnifies how much this adaptation of John le Carré’s 2010 spy thriller lacks in intrigue and suspense. Like The Night Manager, Our Kind of Traitor drops an innocent man into a situation beyond his comprehension and requires him to interact with the most unsavory of criminals. Our Kind of Traitor, though, fails to give us fascinating characters—on both the side of good and the side of bad—who can hold our interest or rise above the dire circumstances that they find themselves. Also, director Susanna White and screenwriter Hossein Amini fail to squeeze any tension out of the efforts of Ewan McGregor’s professor to serve as a go-between for MI6 and a Russian mob money launder who fears he and his family is about to be executed by his boss. British married couple McGregor and Naomie Harris’ Moroccan vacation takes an interesting turn—and sadly the only interesting one in Our Kind of Traitor—when they meet Stellan Skarsgård’s aforementioned money launder. Quicker than Skarsgård can invite McGregor to a party populated by hookers and fueled by drugs he’s recruited McGregor to handover a memory stick to MI6 that contains sensitive financial information about a prominent Russian mobster, known as the Prince, as well as his colleagues and clients. MI6, in the form of Damian Lewis’ scheming agent, then uses McGregor as a means to establish trust with Skarsgård. Our Kind of Traitor hinges on the relationship between a law-abiding man who believes in fair play and an honorable crook forced to sacrifice his comfortable life to protect his family. 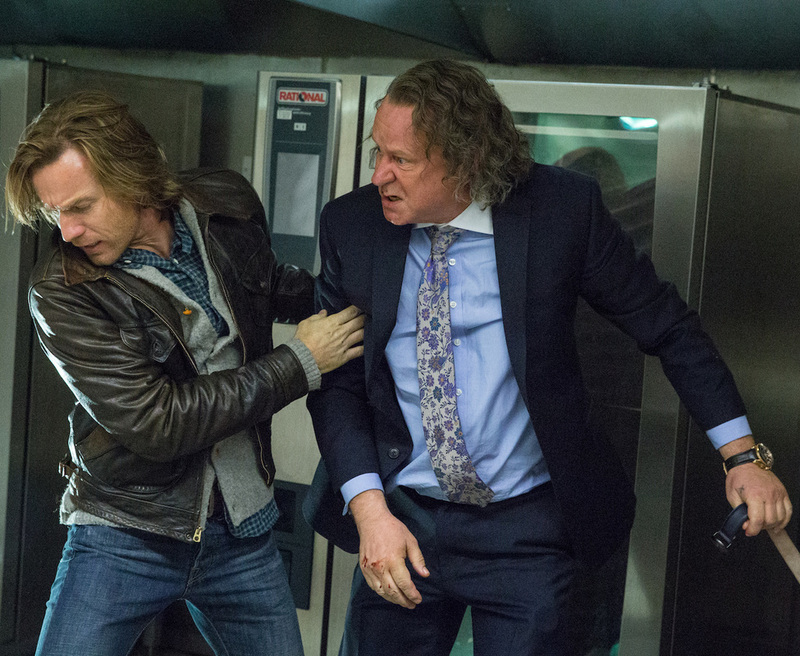 With McGregor failing to shade in his lightly sketched Everyman, Skarsgård loud talks and cajoles his way through Our Kind of Traitor to make this unlikely friendship work. He almost succeeds, but an exchange toward the end of Our Kind of Traitor about his decision to pick McGregor to help him sums up why there’s a real lack of rapport between the two men from two different worlds. Skarsgård would have had better luck establishing a connection with Naomie Harris, who possesses the grit and resilience that McGregor can’t convey. Shamefully, Our Kind of Traitor puts Harris on the sidelines for much of the action. It also does little to pursue the marital tensions between McGregor and Harris that put their estranged couple in this dangerous position in the first place. Our Kind of Traitor’s worst crime, though, is to pit MI6 against a criminal organization that operates with the same dull monotony as your average accounting firm. Perhaps this is why no one in MI6—saved a wronged Lewis—can muster up much moral outrage over the Prince’s efforts to expand his business into England. The feeling is more than mutual long before Our Kind of Traitor reaches its inevitable climax.